The Wildhearts were a band I had never heard of until the early-2000s when the then-relevant Metal Sludge site constantly gave them nothing but praise. I had heard “Vanilla Radio”, which apparently as a huge comeback hit for the band in their homeland of the UK and loved it. 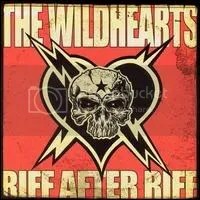 All Wildhearts albums were either out of print in the US or import, and thus I couldn’t bring myself to spend $30-40 on one CD, so I was ecstatic when I found out Riff After Riff was going to be a US release. This album, a collection B-sides that were recorded around the same time of “Vanilla Radio”, was originally released in Japan in 2002 as an EP called Riff After Riff After Motherfucking Riff, but the US release has left off “Vanilla Radio” and has added on an extra six songs. As catchy as “Vanilla Radio” is, there isn’t anything that even comes close to that song here, IMO. Granted, these are B-sides, so you can’t expect too much, but there are a few tunes here worth checking out. Curiously, Gut Records (a sister label to Gearhead Records) would release 21-track complete collection of The Wildhearts’ B-sides the year after this release with an album called Coupled With. I love the cover though, great stuff that would’ve been a cool logo for legendary wrestler Bret ‘The Hitman’ Hart!